The best place for all your wigs is in your bedroom, its where you get ready and look your best before you start the day. Finding a space in your room that you can dedicate to your wig would be a good idea, that way you will always know where it is or they are if you have more than one. If you have the space in your home you could even have a wig room. When you buy your wig it will either be in a box or a transparent plastic packet. When you get it home and remove it from its original packaging, how will you Store your Wig ready for usage? Easily the first option is to use the wig’s original packaging. Apart from the wig always being bundled together, you may have to deal with a few tangles. 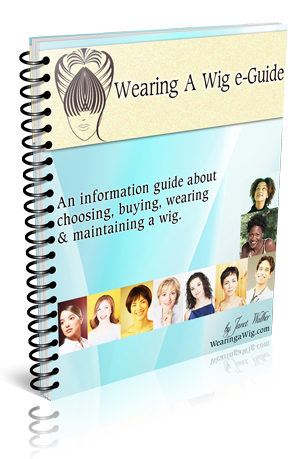 However if you don’t wear your wig on a regular basis this can be your easiest and cheapest method of storing your wig. The most recommended way of storing your wig would be to use a foam wig head or wig stand. These items are made especially for holding your wigs. Depending on where you buy from the price will vary. Most of the foam wig heads are white and can get a little grubby over time. You can get some foam heads that are black or charcoal colour but they are more expensive for they are really for retailers to purchase for displaying purposes. When buying your wig you could ask the shop assistant to give you a foam head for free. When I had my shop I would sell the foam heads but only at half the price if they brought a wig. If my customers brought more than one wig then of course I would give them a foam wig head for free. Even though I stated above that ‘most recommended’ I never said I recommend, why? well I personally don’t use a foam wig head. I use what’s ever at hand in my house and at present my wig is hanging on the corner of a chair. It’s not the ideal place but it does the job. My wig has seen a few unorthodox places, such as my coat stand, a ball of carrier bags and on the drawer handle on my dressing table, again none of these places are ideal but they were convenient and available. For me as long as my wig is in a safe place, is hanging and not bunched up, and not in direct sun light then my wig is being stored. If you use these as your guidelines then there are many creative places that you could Store your Wigs. Share pictures of where you store your wigs. Also if you think of some new and creative ways of storing your wigs, again share in the comment area below.